This is the beginnings of an add-on for Project Red. I hope to add a lot more content. If your contraption requires more than a couple of buttons or levers to operate, the controls can take up a lot of room and leave you puffed out running back and forth between them. A Control Panel lets you fit up to 16 levers, buttons and indicator lamps into one block space for the ultimate in compactness and ease of use. You can make a Control Panel out of any material that a Cover can be made from. Controls for use on the panel can be left plain or painted any of 16 colours. Individual labels can be placed above and below each control. The control panel can be mounted on a surface as shown here, or it can be placed flush in a wall with the cable connecting from behind, so that all the wiring is hidden. 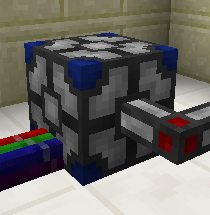 Relays signals between a Project Red Bundled Cable and a MineFactory Reloaded RedNet cable. Fixed controls reverting to white when removed from a control panel. Fixed crash when spawning a control panel using the /give command. Now works in multiplayer again. Control panels may be rotated by right-clicking on an empty cell with a screwdriver, and the initial orientation of a horizontal control panel is determined by the direction the player is facing when placed. Control panels can be placed side by side without connecting to each other, allowing larger control panels to be assembled. 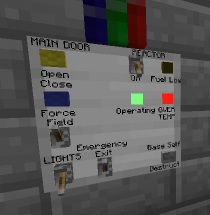 Control panel related recipes appear in NEI. Control panels retain their controls when broken and placed down again. Shift-left-click on a control panel with a screwdriver to pick it up instantly. Breaking a control panel in creative mode does not destroy it. Fixed breakage of MFR 2.8.0 RC3. Names used to find blocks and items from other mods are now configurable to allow any future incidents of this kind to be worked around. Fixed crash with MFR 2.8.0 RC4. Added Bundled Cable to RedNet Adaptor. Fixed display of colour names in tooltips. Added more miniature control creative items. Have it died before producing an offspring? Half a year without a single bugfix. Author is unreachable, not replying to emails and not checking forums.